A rare species of bird has started to produce eggs for the sixth consecutive year at its Northumberland nest. 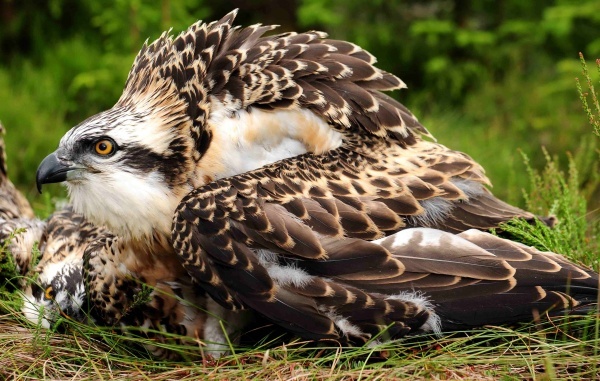 Ospreys - which were extinct in England for over 150 years - have bred successfully in Kielder Water & Forest Park every year since they recolonised in the region in 2009. Now, the Park boasts two breeding pairs, one of which laid it’s first egg of the season this morning (24 April), following a 3000 mile (5000km) journey back from Africa and a romantic reunion at the Park in April. Tom Dearnley, Forestry Commission Ecologist, explains why this is so exciting: “The norm for the females is three eggs, usually laid in intervals of two days so over the next week we’ll be holding our breath for more eggs. We all want to see the population thrive and hopefully more osprey families at Kielder Water & Forest Park. At over 250 square miles, the mix of forest and water is perfect for the species. The ospreys feast on trout from the largest man-made lake in northern Europe, Kielder Water, and nest among England’s largest working forest. Cameras installed in the nests mean visitors can watch the action unfold on CCTV footage beamed live into Kielder Castle and Northumbrian Water’s Leaplish Waterside Park. Fans of the famous birds can also keep up to date with them and the progress of their eggs by checking the blog at kielderospreys.wordpress.com. Kielder Osprey Watch 2014 will run every weekend from when the eggs hatch to when the chicks fledge, behind the Boat Inn restaurant at Leaplish Waterside Park. The Osprey Watch is organised by Kielder Water & Forest Park Development Trust and Northumberland Wildlife Trust, with support from the RSPB. The partners are working hard to ensure that the ospreys are here to stay by maintaining a high quality habitat in Kielder Water & Forest Park and safeguarding and monitoring the nest site. To find out more, go to www.visitkielder.com. Kielder Water & Forest Park is the ultimate outdoor playground that everyone can enjoy.